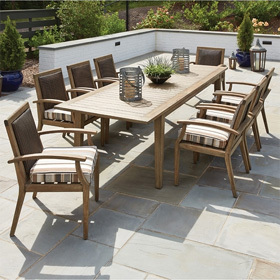 With its sturdy construction and simple aesthetic, this outdoor bistro dining table offers an ideal balance of durability and versatility. Plus, the textured embossed aluminum top lends the patio table the perfect hint of style. This table provides plenty of surface space for two people and was designed to coordinate with Telescope Casual's outdoor dining chairs. 30"L x 30"W x 28.5"H 29 lbs.